Every Monday morning I rise at 4 a.m. to catch the first train for Paris and then on to Fontainebleau, where I spend 2 days on campus. On Super Bowl Monday (in France) I was up even earlier. The siren call of the big game dragged me from slumber at 3:15 as the fourth quarter was getting under way, and I enjoyed the final 15 minutes of play over a bowl of Cornflakes and glass of Provence apple juice. My son Jess will tell you “dude, that stuff totally kills,” which is a good thing. To say that the French love American football is grossly untrue, but the game was live on national television, much to my amazement, starting at midnight. 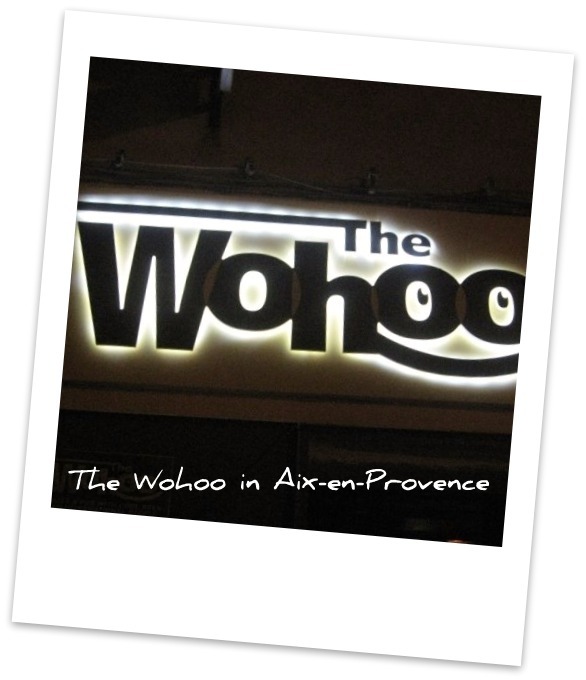 It was also playing in a few bars around Aix-en-Provence, which has just enough Americans to warrant the effort. Given the early hour it may have made more sense to bypass the bed, watch the game over a few pints at the Wohoo Bar, then sleep them off on the train north. Alas my head was clear and sober as I made my way down Cour Mirabeau in the early hours before dawn, unlike a few bleary-eyed revelers stumbling home in the chill air. Getting older can be a mixed blessing: less fun, better feeling. You may be surprised to learn that France has an American football league, and we are blessed to have a club – the Argonauts – right here in Aix. Jess and I joined the small throng of loyal if not slightly confused fans on opening day at their small home stadium. American football in France is a different experience. No, brats and beers in the parking lot are not replaced with brie and white wine. In fact there was no tailgating at all, which is a great missed opportunity given the French love affair with food and impressive picnics. Music was blaring constantly during gameplay, including a heavy rotation of AC/DC (always stirring when blasted at max volume through a stadium sound system). The announcer made no pretense of impartiality, leading the crowd through throaty cheers of DEFENSE (clap clap clap), DEFENSE (clap clap clap), and playing the Florida State Seminoles war theme as fans broke out the tomahawk chop. What the hell? This required a timeout and fact check with my history expert – Jess – who is obsessed with all things Greek and Roman at the moment (a little math obsession wouldn’t hurt). Any thread connecting the mythical Greek Argonauts (450 BC) to the Seminole Indians (1800s)? No, none that he was aware of (this after a 5 minute lecture on the golden fleece, Jason, and the historical distortion of his voyage as presented by the Hollywood film). Okay, back to the game. In French American football running backs are coureurs, a down is a tentative, and referees are arbitres. Many of the terms are similar however: ballon (ball) and receveur (receiver) are logical enough, and quarterback and touchdown are unchanged. Even the linguistically challenged can follow along easily …or so I’ve been told. Seattle native Adam Kruse is the quarterback of the Argonauts, starting his second season this year. He had a stellar college career at University of Mary (NCAA Division II) before joining the Tacoma Cobras (PDFL) as a stepping stone to the NFL. He’s an impressive athlete, throwing the ball on a wire with laser accuracy or tucking it on for an evasive scramble up the field. Adam was unstoppable that Sunday, as evidenced by the final score: 44 to 0 for an Argonauts win. I was curious to know more about his motivation to pilot a French football team so offered a beer as trade for an interview at the Wohoo the following week. Fascinated as I am with the whys, whats, and wheres of career fulfillment, I hoped for some pearls of young wisdom about aspirations and limitations. One key to a sense of fulfillment is success and a key to success is the setting in which one thrives. All too often we shoehorn ambitions into a box of convenience bounded by where we live and what we do now, and what we consider possible. Fall into this rigid frame of thinking and you may spend more than a few sleepless nights anxious about the future, unhappy with professional and personal situations, and at a loss for new options. Sound familiar? We get anchored by family, home, job, and the material things that accumulate. Anchors are great for mooring us in place, a heavy drag when under sail. When I felt compelled to sail I didn’t just raise the anchor, I cut the chain. Refuse to be tied to place or role (personal or professional) and a world of new possibilities open up. You don’t have to cross an ocean, but be open to leaving your haven of safety. There is indeed value in enjoying a comfortable life near family and friends, parents and grandchildren, but there is greater value, I believe, in finding your Mission and making the most of your potential; exhausting your well of resources while still operating at peek. In fact, at ages 50 or 60 you are better set to tackle a Passion Plan than at 25. Experience and maturity play to your favor, and the engine remains strong with some attention to diet and fitness. The world benefits from each of us excelling, not simply sacrificing our ambitions for others and letting ourselves out to pasture. J.S. Bach had 20 children and was still breaking new musical ground at 65 when he passed away. What a loss to us all had he decided to live through the many accomplishments of his talented kids. Great people take deep dives into their personal genius to achieve great things and we are all the richer. Isn’t it worth asking the question: what is my personal genius? Isn’t it an obligation? Picasso’s belief, that every act of creation is first of all an act of destruction, is not required in all situations. When contemplating an encore career, consider porting your skills and experience to an adjacent universe, one defined by laws more amenable to your natural lifestyle (hours, uniform, pressures, possibilities, etc.). You don’t have to become a potter, painter, or poet, unless the Milton or Neruda inside is aching for expression. I know a burnt-out banker who loves the relaxed mentoring of university life, whose reward is no longer the year-end 7 digit bonus but the reverence of students. I met a career mathematics professor who felt stifled, under-challenged, and under-compensated, and who now thrives in the pressure cooker and possibilities of a high-frequency quant trading firm. Neither job is better by definition. Both individuals made late-career transitions to adjacent universes defined by very different laws, but did not involve a complete reinvention of self. The moves were not seamless, but possible without undo upheaval. The individuals have transferred their experiences to a new dimension and as a result are blooming. Change of location offers a similar opportunity to break from the anchor. A good friend has taken his considerable talents as venture investor from Silicon Valley – where he felt undistinguishable from the hundreds of hypercompetitive and accomplished (or hoping to be) investors – to a city in the Midwest, where his valley experience is greatly appreciated by and singular amongst his peers. He didn’t hate his profession, he hated feeling mediocre. Don’t we all? As mentioned above, I believe that a key to happiness is success, the opportunity to demonstrate excellence. But to realize that success one needs to operate in the right universe. Physicist Brian Greene – a pioneer in string theory and author of a new book on the multiverse (The Hidden Reality: Parallel Universes and the Deep Laws of the Cosmos) – discussed in an NPR/Fresh Air interview recently that the cosmos can be imagined as an infinitely large loaf of bread, with each slice representing a different universe, similar in many aspects but governed by very different laws of nature. The way I see it, as the years tick by and we pass through that membrane of core careers to what comes next, we may need to operate under a very different set of laws to flourish. A change in universe may be warranted, to a universe who’s laws are more amenable to our maturing ambitions and the challenges of meeting them. When we feel sandwiched between the needs of kids (soccer practice, college tuition), parents (doctor’s visits, grandchildren time), and spouse (his/her career, personal pampering), it is easy to compromise our own goals. As children move on and parents pass on (and you decide on the spouse part), there is a liberation effect. Does your universe and the laws that define it feed that liberation? The Wohoo is filled to capacity on Wednesday at midnight. Given its tiny size, the Wohoo is probably close to capacity when it’s just the staff setting up. The street level bar entry is smaller than my bedroom, and the downstairs cavern is divided into 2 cramped spaces that appear carved out of the rock. It’s here that I find Adam holding court after an evening Argonauts practice. He is what my mother would have called “a very nice young man:” courteous, well spoken, engaging, and interesting. Why is he playing American football for a small French audience? Simple, he loves to play football and he loves to travel. The Argonauts pay him a modest salary, he gets in 5 months of play during the US offseason, and if the team does well it will look good on his scouting report. As to my 2 burning questions of momentous import: the tomahawk chop??? He has no idea either, but anything that gets the fans involved in the game is a good thing. The multiverse? Well, we didn’t get to the multiverse, but Adam would probably find that all a bunch of high-minded horseshit. He just likes playing football and living in the south of France. I can’t argue with that. Postscript: perhaps somewhere in another universe, a universe parallel to our own, a slice next to our slice, Seminole Indians watch a Grecian ship break the horizon. Who knows? Previous Post: Passion plans? Yes, …and you? Many thanks to Al and Joe for bringing “Playing for Pizza” by John Grisham to my attention. It’s a novel about about a 3rd string Cleveland Browns quarterback who ends up playing in the Italian National Football League. A must on my reading list!